Throughout my hiking career, I have tried Under Armour, Patagonia, Wigwam, & Smartwool socks — basically, any brand of merino wool socks out there, I have hiked and skied in. The end result? 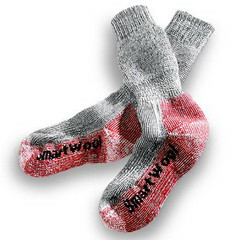 Smartwool makes the world’s softest socks. And I don’t mean for just hiking. I wear my wool socks 365 days a year for any activity. Nothing keeps your feet cozier in the winter than merino wool, nor breathes as easily during summer strolls. Using the best New Zealand shearling allows smartwool socks to breathe, which maintains a stable foot temperature and provides you with extreme comfort during any activity. 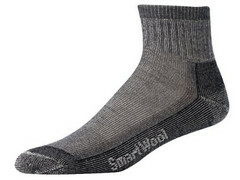 Increased breathability also means you can wear smartwool socks for days without making them smelly. Need more benefits? High quality wool wicks away moisture, preventing foot blisters. The bottom line is this: if you are looking for the best merino wool socks that dry quickly when wet, never get stinky, reduce the likelihood of blisters forming, and compress easily for travel, you need Smartwool socks. Smartwool puts the name “Smart” in their brand for a reason. Using the finest Merino fibers, Smartwool technicians will enhance natural merino wool qualities to make your sock, well, smarter! 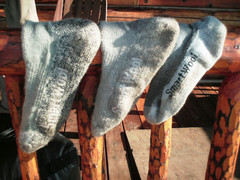 There are three types of smartwool sock styles: light cushion, medium cushion and heavyweight cushion. Each has advantages and drawbacks. 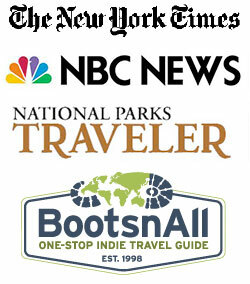 Medium Cushion Hiking Sock – I never leave home without a pair of these. 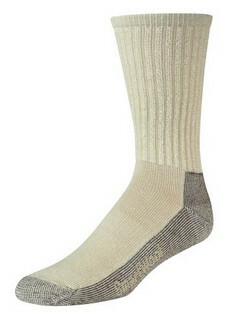 Unquestionably, medium cushion is my favorite style of wool sock and can be used effectively day-to-day and while hiking. Light Cushion Hiking Sock – Light cushion is the perfect choice for summer activities that do not involve long and extensive hikes. While these socks are suitable for mild day hikes, the relative lack of cushioning makes this style of merino wool sock less than ideal for long hikes or backpacking adventures. Biking, summertime lounging and general activities are perfect. Heavy Cushion Hiking Sock – Extra insulation makes heavy cushion hiking socks perfect for extreme weather activities. However, you need boots with adequate room to accommodate the additional cushioning. Unless you plan on winter backpacking, or other comparable activities, you do not need these socks. Protect Them – There is nothing wrong with wearing your wool socks shoeless around the house or on a lawn. Concrete however, is a big No-No! Have you tried Darn Tough socks from Vermont. I’ve used the same socks skiing and traveling through Death Valley (not on the same day). Check out their guarantee, I haven’t been able to try it yet, I can’t seem to wear their socks out.